Actor, singer and activist Harry Belafonte accepted the NAACP’s Spingarn Medal on Friday night in New York City for outstanding achievement by an African American in 2012. Reprising a powerful speech he delivered at the NAACP Image Awards on February 1 in Los Angeles, he urged Black America, especially its artists, to get involved in the ongoing fight for social and economic justice, particularly in the areas of gun and prison reform, and eradicating poverty. He elaborated on the role the accomplished singer, actor, athlete, and activist Robeson played in inspiring his own work as an artist/activist. He suggested as a solution, that what’s missing in the struggle for justice today is radical thought. “America keeps that part of the discourse mute,” he claimed. Here is the speech in its entirety from today’s broadcast of Democracy Now. 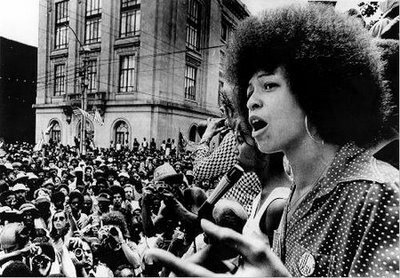 Born and raised in Birmingham Alabama and educated at Brandeis University, while studying French and philosophy in Paris, Angela Davis learned of the bombing of the 16th Street Baptist Church that killed the four little girls with whom she’d been acquainted at home as a child. Continuing her studies at home and abroad, she eventually returned to UCLA and Los Angeles in 1969, a time where the heat was turned up high on the Black Panthers, as well as anyone else interested in the politics of revolution; the UC Board of Regents made it difficult for her to teach peacefully. When she was falsely accused of being an accomplice in the kidnapping and murder of Marin County Judge, Harold Haley, she served time in a California detention center. A nationwide, grassroots campaign to liberate her contributed to her being set free after 18 months and her ultimate acquittal. In 1972 the Rolling Stones recorded “Sweet Black Angel” about her on their epic set, Exile on Main Street; John and Yoko/Plastic Ono Band cut “Angela” on their Some Time in New York City album (the Stones sing “keep on pushing,” while John and Yoko tell her to “keep on moving”). 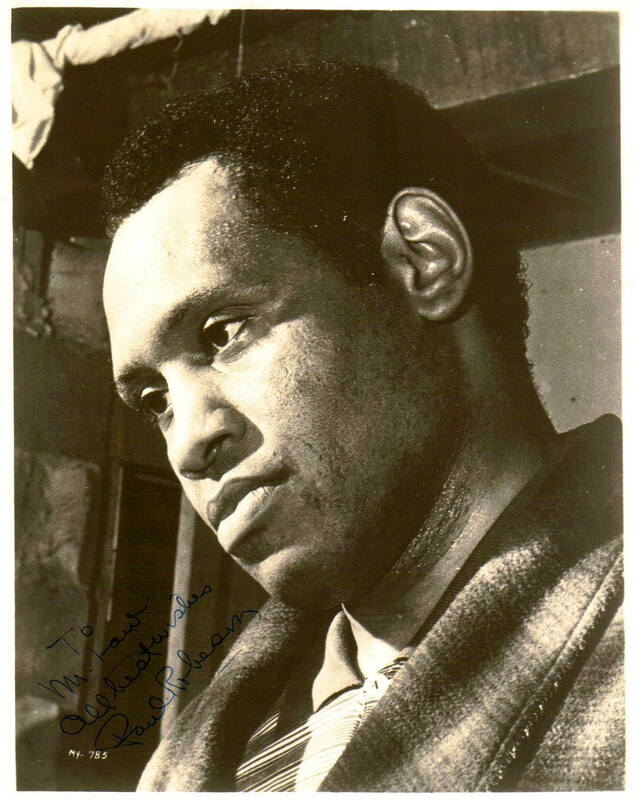 Harry Belafonte was inspired by the works of singer-actor Paul Robeson, who became a mentor. Early in his career as an actor turned singer, he reached out to foster a cross-cultural alliance with South African artists like Miriam Makeba and Hugh Masekela. 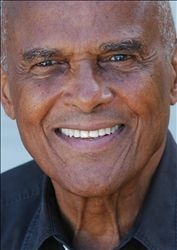 On the Greenwich Village music scene, Belafonte had familiarized himself with traditional American folk songs through his work in the theater. 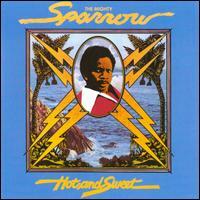 In 1956, he released Calypso for which he turned to his Caribbean roots; it would sell in the millions. Choosing his roles and repertoire with precision, Belafonte was uncompromising as an artist which earned him a commanding reputation; he explained that sometimes it was difficult for his peers to metabolize his energies, though he didn’t mean for it to be this way. 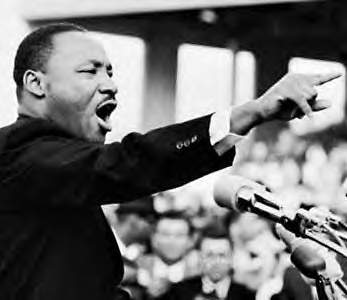 As it was, he was the obvious choice for Dr. King who needed his assistance organizing the entertainment communities and their financial resources for the Freedom/Civil Rights movement. Helping to organize the March on Washington, Belafonte became not only a confidante of Dr. King’s but he helped introduce African music to wider audiences. His relationship to South Africa and the struggle against apartheid grew deeper; he became an intimate of Nelson Mandela. From famine relief in Ethiopia to working with the incarcerated in the USA, Belafonte’s artistic gifts landed him on the frontlines of activism, which is where he’s lived for over 50 years. The similarities between Belafonte’s and Davis’ stories are striking, a man and woman, two different generations, one a drop-out, the other highly educated. Yet both told stories of their mothers, young country girls who had to overcome resistance, obstacles and indignities to get themselves schooled, then went on to become fierce defenders of education. Today, both Belafonte and Davis are advocates for education, especially among prisoners—the people Davis calls “the other one percent”—who need to know their basic human rights. Education has also been proven as a solution to recidivism, and contributes to the greater good of humankind, inside and outside prison walls. Both activists also share a vocal and visible enthusiasm for the Occupy Wall Street Movement; both had visited the New York encampment, while Davis has visited and spoken at various Occupy demonstrations. She said that on November 2, the day the Port of Oakland was shut down, she joined somewhere between 10,000—to 15,000 people on the street, some of them from her own generation, all of them cheered by the protests led by the new generation of activists. As for President Obama, and to anyone who may be disillusioned by his performance after three years on the job, Davis offered a reminder. I probably don’t need to add that Mr. Belafonte, 84, and Ms. Davis, 67, were both extraordinarily gracious while greeting their public after their formal presentations. They took time, meeting each gaze and responding to the individual requests of handshakes and photos with them. Their love for the people, has made them much beloved by the people. The warmth generated in the rooms they occupied in LA during the blustery last week of November/first week of December will sustain some of us through the upcoming season—the one that passes for winter around here. Lead Belly was born around this day of January in 1888 or nine. This is a portion of his story, adapted from my Crawdaddy! column, The Origin of Song. “I’m obsessed with him. He’s my favorite performer,” said Kurt Cobain. “No Lead Belly, no Beatles,” claimed George Harrison, and the same may as well be said for Led Zeppelin, whose Jimmy Page was rocking “Cotton Fields” back in 1957. According to Van Morrison, “If it wasn’t for Lead Belly, I may never have been here.” And yet, Lead Belly—born Huddie Ledbetter near Mooringsport, Louisiana in 1888—is rarely the first traditional American musician historians credit with the creation of rock ‘n’ roll or the bands of the British Invasion. His contribution to rock is as fundamental and profound as those of Robert Johnson and Muddy Waters, so why is it we don’t hear that much anymore about his legend? Perhaps it can be blamed on the boll weevil he sung about—and it indeed may have something to do with cotton—though the diminishing of Lead Belly’s influence on rock is likely just another case of the forgotten origins of song. The Louisianan’s sound first came to impact the young lads who would go on to form the classic rock bands of the ’60s via the British Isle’s mid-’50s skiffle craze. Rooted in the jug band style of the 1920s, skiffle’s homemade and improvised style relied on the wacky sounds of household items like washboard, comb, and homemade instruments—the stuff that makes for its irresistible, ecstatic sound. Glaswegian Lonnie Donegan’s frantic version of “Rock Island Line”, first popularized by Lead Belly, swept across the land like skiffle-mania, boosting guitar sales and launching a thousand bands, like young Jim Page’s combo as well as the Quarrymen (who we all know by now birthed the Beatles). For Morrison—who’d already developed a taste for the blues voices of the American South—skiffle provided confirmation of the potential for what an Irishman could do with a Black American folk sound. The Lead Belly repertoire meeting English skiffle marked the beginning of his long association with rock ‘n’ roll; though stateside he was more of a singular phenomenon, as well as a folker. Coming up through traditional, mythological American folkways, it is said that folklorist John Lomax discovered Lead Belly during the singer’s stay at Angola, the Louisiana state penitentiary (it was his third incarceration). It was there that Lomax and his son Alan recorded songs by him for the Library of Congress, some of them passed on to Lead Belly through his association with Blind Lemon Jefferson; among them was the standard “Goodnight Irene”, which eventually became Lead Belly’s calling card. As one version of the story goes, Lomax pressed a record of Lead Belly and presented it to the state’s governor, who was so taken with it that the prison doors unlocked for his release. So off went Lomax and Lead Belly, at this point close to 50 years old, to New York and toward a career in show business. As a late-comer to the game, Lead Belly was not in on the earliest rush of race records in the 1920s and 1930s, and so it was his less-than-polished Lomax recordings that would come to define him; that may be one contributing factor toward explaining a present-day resistance to a full embrace of Lead Belly as pre-rock ‘n’ roller. Additionally, Lomax’s song-catcher practices are a source of controversy and a sore subject among blues researchers. Objections to the way Lead Belly was discovered, promoted, and recorded are cited; indeed, shortly after his initial agreement with him, it appears Lead Belly found the arrangement with Lomax unacceptable too. Though not long after severing ties with Lomax (he would eventually resume relations with the Lomax family) Lead Belly accepted a press opportunity to be photographed, costumed in black and white prisoner’s attire, performing his role of ex-convict made good. By the end of the ’30s, he’d gone on to find success writing topical songs (“The Bourgeois Blues”) and fell in with the left-leaning protest singing community—though he didn’t necessarily abide its progressive politics. His association with fellow travelers, Woody Guthrie and Pete Seeger, found the FBI hunting him as well. What Lead Belly, the folksinger, really desired was to launch a career in Hollywood, but that wasn’t meant to be. But like cotton, the King of the 12-String could not remain king forever. Them old cotton fields back home were beginning to recede from popular consciousness as songs of urban discontent began to take their place. In addition, the Rolling Stones, who had previously brought their audience to Muddy Waters and Howlin’ Wolf, were now touting Robert Johnson. Their 1969 version of his song “Love in Vain” preceded to the market place the 1970 release of King of the Delta Blues Singers, Vol. 2, with its new cache of Johnson songs. The Johnson and Delta influence remains a big deal to this day, its legends and iconography completely enmeshed with blues culture as we know it. Lead Belly’s prison songs, children’s songs, and field and work songs didn’t fit so neatly into bluesology, and rock became a Lead-free zone, with a few notable exceptions. In 1977, Ram Jam put some Southern rock funk into Lead Belly’s “Black Betty,” though the Top 20 single wasn’t a hit with critics or (according to lore) with racial equality groups. The track played Lead Belly’s rock potential to maximum effect (though it is regrettable if anyone got hurt by it). As the ’80s arrived, punk rock and new wave took Lead Belly underground with it, as Bongwater, Michelle Shocked, and X became keepers of the flame. Proudly in synch with the pulse of the people and the hard times that echoed his original era, X turned “Dancing with Tears in My Eyes” into an elegy for a loved one and revived “Rock Island Line” with their folky side project, the Knitters.” A Vision Shared: A Tribute to Woody Guthrie and Leadbelly joined Little Richard and Fishbone on “Rock Island Line” and Beach Boy Brian Wilson came back for another pass at Lead Belly on “Goodnight Irene”, though the project did more for boosting the rock cred of Guthrie (who got the Springsteen and Mellencamp treatment) than it did for Lead Belly. From there, it was on to the Pacific Northwest and under the bridge where Kurt Cobain lived. The Nirvana man brought his tape of Lead Belly songs to his band’s earliest rehearsals; he and fellow founding grunge scenester Mark Lanegan shared an enthusiasm for him, as heard on their duet of “Where Did You Sleep Last Night?” (found on Lanegan’s The Winding Sheet album). Nirvana’s definitive performance of the song on Unplugged was an immediate highlight of that show, when Cobain’s guttural wrenching was assumed to be tied to his personal life and precarious emotional states. It’s hard to top that one, though when Alvin Youngblood Hart rejuvenated “Gallows Pole” in Lead Belly-style on his 1996 album, Big Mama’s Door, he brought back Lead Belly’s quickness and dexterity on his instrument full circle: Just man and guitar. Lead Belly lived out his final days in New York, eventually succumbing to ALS (Lou Gehrig’s disease) in 1949. Had he lived another year, he would’ve seen his signature song, “Goodnight Irene”, turned into a million-seller, a #1 hit as interpreted lightly by the Weavers. The overlooked genius of Lead Belly is that his songs and mighty rearrangements continue to transgress genres and generations, from folk to rock, from Pete Seeger to Jack White. Just think what we would’ve missed had Jimmy Page pursued a career in research science as he’d intended rather than picking his way to the top of the “Gallows Pole.” By the 21st century, the White Stripes played “Red Bird” and “Take a Whiff on Me”, and if the show went well, they’d close it with “Boll Weevil”, yet another folk tune popularized by Lead Belly. I’ve heard of Two Gallants playing “Mother’s Blues” aka “Little Children’s Blues” live, though only time can tell who’ll be the next in line to shine an ever-lovin’ light on the songs of Lead Belly. The Last Holiday: Remembering Dr. MLK, Jr. It was a long road to the third Monday in January when all 50 states observe the birth of Martin Luther King, Jr. and the day named in his honor. Largely owed for making the dream of a King holiday a reality is Stevie Wonder, who back in 1980, wrote the pointed song, “Happy Birthday,” then launched a 41-city U.S. tour (and invited Gil Scott- Heron along) to promote the idea which was first mooted by Rep. John Conyers in 1968. The musical efforts were ultimately the key in collecting the millions of citizen signatures that had a direct impact on Congress passing the law signed by President Ronald Reagan in 1983, declaring a day for MLK. Observed for the first time in 1986, some states were late to the party, however, by the turn of the 21st Century, all were united in some form of remembrance of the civil rights giant. “Happy Birthday,” which served as the Wonder-campaign theme (and is now the “official” King holiday tune) is the last track on Hotter Than July. The album also features “Master Blaster,” Wonder’s tribute to Bob Marley (he’d been scheduled for the tour until he fell too ill to participate). Stepping into the breach was Scott-Heron whose 2011, posthumous memoir The Last Holiday, details his own journey with music and activism, and helps retracethe long and winding road Wonder took to bring home the last US federal holiday, with the help of a song. The Hotter Than July tour brought Gil and Stevie to Oakland, where they played in the name of King, as did Rodney Franklin and Carlos Santana. In a weird turn of events, the concert coincided with the shocking night John Lennon was killed. The musicians and crew learned of the tragedy from a backstage television; the job fell to Wonder, with Scott-Heron and the other musicians at his side, to deliver the news to the arena of assembled music fans. “For the next five minutes he spoke spontaneously about his friendship with John Lennon: how they’d met, when and where, what they had enjoyed together, and what kind of man he’d felt Lennon was,” wrote Scott-Heron. “That last one was key, because it drew a line between what had happened in New York that day and what had happened on that motel balcony in Memphis, Tennessee, a dozen years before. And it drew a circle around the kind of men who stood up for both peace and change.” Scott-Heron devotes the final pages of The Last Holiday to a remembrance of how the murder of Lennon fueled the final drive to push for a federal observance of an official MLK Day. 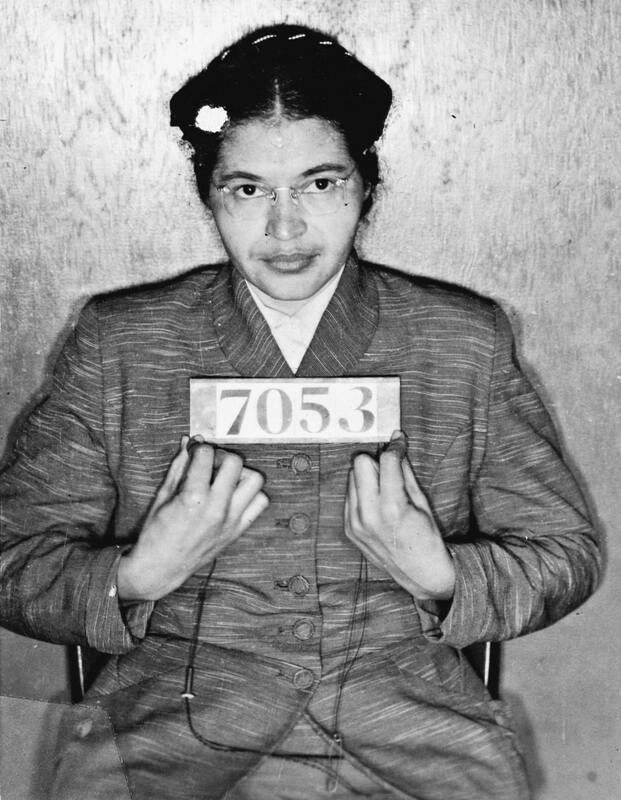 February 4 is the birthday of Rosa Parks, the civil rights activist remembered for refusing to move to the back of the bus: The Montgomery Bus Boycott, in the name of the desegregating public transit, was organized immediately following her arrest on December 1, 1955. Born Rosa Louise McCauley in Tuskegee, Alabama in 1913, Parks was a student of non-violent protest, an active member of her local chapter of the NAACP in Montgomery and a great admirer of both Dr. King and Malcolm X; her refusal to move on the bus that day was not part of any kind of group action or occupation—she held her seat on her own steam. And yet far from receiving any heroine’s awards, Parks paid the price for asserting her right to ride: In the immediate aftermath of the desegregation effort, she could no longer find work in Montgomery. She and her husband Raymond moved north, eventually settling in Detroit where she worked the better part of her life as a secretary for US Representative John Conyers. Parks would one day receive the highest honors in the land– from the NAACP’s Spingarn Medal (Harry Belafonte was honored in 2013), to the Presidential Medal of Freedom (awarded to her by President Bill Clinton) and the Congressional Gold Medal. And if you dared to mess with the Mother of the Modern Day Civil Rights Movement and her legacy in a movie or a song, look out: Parks was known for slapping down artists with legal actions and launching her own boycotts against them. But there was one song that met Ms. Parks’ high standards: “Sister Rosa,” a tribute to her by New Orleanians the Neville Brothers, appeared on their 1989 album, Yellow Moon. Produced by Daniel Lanois, and accompanied by The Dirty Dozen Brass Band and Brian Eno for the sessions, Yellow Moon is an exceptional record, even by the Nevilles’ own high standard: Produced by Daniel Lanois, the band transforms two Bob Dylan songs (“With God On Our Side,” “The Ballad of Hollis Brown”), the Carter Family classic “Will the Circle be Unbroken,” Sam Cooke’s civil rights anthem, “A Change is Gonna Come,” and Link Wray’s “Fire and Brimstone” (title self-explanatory, taken from the guitarist’s obscure and brilliant 1971 album). 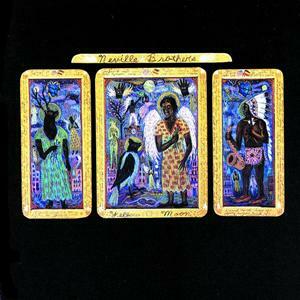 Standing alongside the Neville Brothers’ bayou-fired originals, “Sister Rosa” is their attempt at rap. Parks passed in 2005, though matters of her personal estate have not been resolved and her detailed personal archive has not yet found a permanent home. She would’ve been 101 this year. For more information on Rosa Parks, visit the Rosa and Raymond Parks Institute. We Still Insist: Freedom Now! Good Morning, Happy New Year, and Happy Birthday to the Emancipation Proclamation, 151 years old today. Back in ’63, when the document intended to free all slaves was just a spry 100-year-old memory, We Insist! Max Roach’s Freedom Now Suite, was conceived as a performance piece to celebrate that centennial. 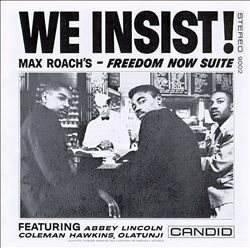 Freedom Now, as it is more commonly known, is credited for fusing the politics of black liberation with the sound of freedom, much the way Sonny Rollins and his Freedom Suite of 1958 was the first experiment in liberation sound. Max Roach was born in rural North Carolina for the record on January 10, 1924 (though by his family’s recollection it was the January 8) and raised in Bedford-Stuyvesant, Brooklyn. But Roach was not only an innovative drummer who revolutionized jazz rhythms, he was actively engaged as a civil rights advocate, and he spoke and performed frequently for the cause. Roach’s epic recorded suite, with vocals by his then-wife Abbey Lincoln (with Coleman Hawkins on sax, Olatunji on congas and lyrics by Oscar Brown Jr.) sounds as radical as the ’60s revolution in words and sound it helped to launch. The cover art, rendered in bold black and white, was groundbreaking graphically and imagery-wise: Its depiction of three African American men at a lunch counter, a white waiter standing by, is of course a reference to the sit-in on February 1, 1960 at a Greensboro, North Carolina Woolworth’s store that became a pivotal action in the non-violent fight for civil rights. 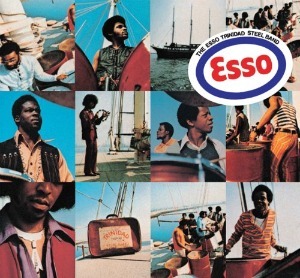 But inside the cardboard sleeve, the vinyl grooves were an assault on the senses, capturing as they did the sound of exploitation, degradation, and ultimately, freedom. A sonically and politically strong statement, the Freedom Now Suite is a cornerstone recording in the history of contemporary black liberation music and remains a challenging, invigorating, and inspiring listen. 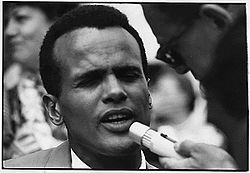 Making a link between the oppression of negroes in the US to blacks throughout the world, Roach and other politically motivated American artists like Harry Belafonte and Nina Simone sought to parallel the civil rights movement in the US with the unfolding liberation of Kenya, Ghana, Congo, and Algeria. Dubbed the Year of Africa, 1960 held hope for the continent for independence from France, Britain, and Belgium and the promise that human rights, dignity, and economic health would be restored throughout the land. Fifty-four years later, the people here and there continue the fight for human rights, and the chance to be emancipated from the conditions of poverty, ill-health, environmental crisis, and violence that defines both our lands, while Freedom Now Suite still pounds out the sound of impending liberation. The following clip depicts black power couple Max Roach and Abbey Lincoln with their band (Clifford Jordan, tenor sax; Coleridge Perkinson, piano; Eddie Khan, bass) performing the suite’s “Triptych (Prayer/Protest/Peace)” on Belgian television in 1964. Roach passed in 2007, though in his lifetime he he’d been a recipient of the USA’s MacArthur genius award, a commandeur in France’s Ordre des Artes et les Lettres, and a RIAA (Grammy) honoree. Read more on both Rollins, Roach, and their respective Freedom Suites in Keep on Pushing. There is only one voice like Mumia Abu-Jamal’s, its tone perfect for professional broadcasting, its message carrying necessary information for our times. But Abu-Jamal, as most people know, is no longer primarily an announcer by trade. 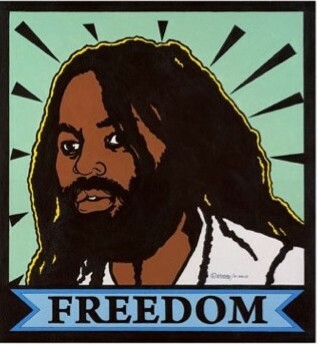 Better known as Mumia to the worldwide community of human rights activists who support his case, the former radio journalist has been serving time in prison for over 30 years now. He has spent much of that time writing and appealing his case. In the documentary Long Distance Revolutionary, filmmaker Stephen Vittoria and co-producer/Prison Radio sound recordist Noelle Hanrahan, make a compelling case that Mumia’s situation as a prisoner for life is more than a miscarriage of justice: Rather than retell the circumstances that lead to the incarceration of the journalist/activist (whose views forced him to moonlight as a cabbie, just to survive), they shine a light on how he’s used misfortune as opportunity, to become a prophetic voice for the voiceless. Angela Davis, Amy Goodman, Alice Walker, Cornel West, Tariq Ali, Ruby Dee and James Cone are among the scholars, theologians, journalists, actors, activists, writers, colleagues, and family members who testify in the film on the important role Mumia—the writer as political prisoner—plays on the world stage, reflecting the revolutionary’s role in contemporary American society. Through interviews, news reel footage, photographs and most of all, interviews and sound recordings of Abu-Jamal, Long Distance Revolutionary tells the story of an intuitive and self-described “nerd” of a child, Wesley Cook, who journeyed into the Black Panthers, then followed his call to report on his city as he saw it, much to the distaste of its notoriously racist law enforcement. Of course, that’s business as usual in the land of the free, while the mystery that unfolds onscreen in Long Distance Revolutionary is more to a specific point: Just how does a death row inmate as sharp as Abu-Jamal keep his mind in shape and his spirit alive while the state does its job squeezing the life out of him? Of particular note are the words of literary agent Frances Goldin who I’m unable to quote here, but who talks of how she was sufficiently moved by Mumia’s prose to take a chance on him in the book market. But the most convincing voice of all is Mumia’s own which can be read in his multiple books in print all over the world and heard on Prison Radio, still recorded by Noelle Hanrahan. At the film’s premiere in Mill Valley, California last October, Mumia delivered an address, especially recorded for the Bay Area. He remembered its “luscious sun,” and the Bay as a place where he, “a tall, skinny, dark sunflower,” could be among some of the “best, boldest, blackest, sweetest” brothers and sisters he claims to have known. Curiously, the film’s only musical voice in the chorus is M-1 of Dead Prez. Used to be musicians sang out for injustice, the way that Bob Dylan once did for Rubin “Hurricane” Carter (who also appears in the film); in that case, the musical association indirectly lead to Carter’s exoneration. But the music community has largely remained silent on the subject of Abu-Jamal. So where are the other contemporary Musicians for Mumia? According to director Vittoria, the usual suspects were approached, but only Eddie Vedder responded to the urgency of the call. 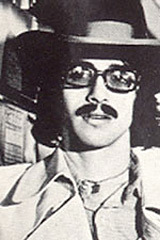 “Please know that I (and my co-producers) tried hard to get…and a number of other musicians into the mix—on numerous occasions and through numerous fronts—but not one of them would agree to interview (except M-1) and/or offer a musical piece or new selection,” Vittoria wrote in an email to me. Vedder’s song “Society” (previously associated with the feature film, Into the Wild, concerning environmentalist/adventurer, Christopher McCandless) serves as the film’s closing theme. “I was fortunate that Eddie allowed us to grace the film with his powerful song,” added Vittoria. GOOD OL’ USA–June has been quite a month so far: Bradley Manning’s trial kick-off was the first troubling thing, while jury selection for the George Zimmerman case must’ve been way more than just troubling for the family of Trayvon Martin. For those strung out on the injustice of the young man’s killing in 2012, it is post-traumatic revisitation time. Then there was the terrible mass shooting in Santa Monica. Just as my heart broke in two, thinking of friends and old neighbors we’d left behind there, we got the news (?) the N.S.A. is surveilling just plain folks on the regular. I thought we knew this already and so I just figure time is going backwards now. 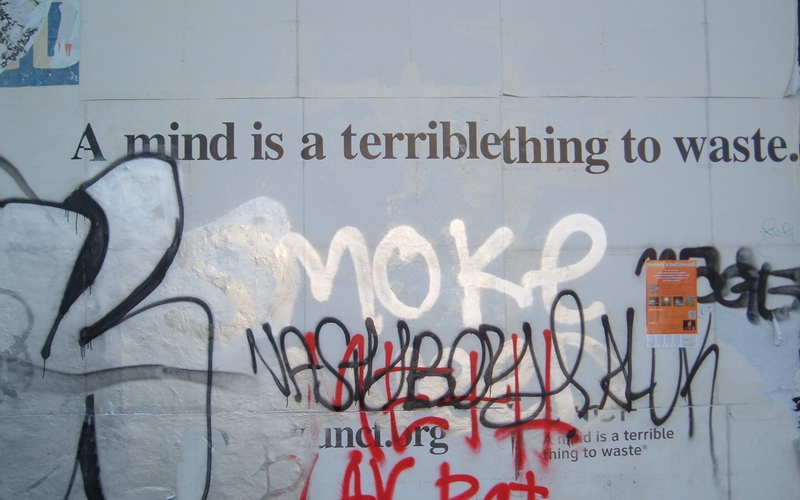 Incidentally, while all this was going down, I saw a defaced billboard/piece of street art that seemed to fit the mood ’round these parts. “I have so much trouble on my mind,” I told my husband, not even counting the day to day personal challenges of survival. “I know,” he said, though at least we could laugh at me quoting Chuck D accidentally without irony. Meanwhile, a national historic landmark, located in San Francisco, was moving into jeopardy. The Richardson-Johnson family, proprietors of the Marcus Book Store in the Fillmore district, have been on a course of change for over 50 years here and have survived those changes royally. Founders Julian and Raye Richardson were directly invested in the struggle for civil rights and equality, first with their Success printing company, followed by the opening of their bookstore. To cite just one example: During the historic student strike at SF State in 1968, they used their home as collateral, to pay the bail for those arrested in the demonstration. They also printed the student paper when no one else would touch it. The result of the student action, by the way, are today’s multicultural studies departments and diversity programs enjoyed on college campuses from here to Timbuktu (and when I say Timbuktu I do mean Timbuktu, quite literally). Marcus Books, named after Marcus Garvey, specializes in books about Africa and African Americans, books by and about black people, among other things. The authors they’ve hosted are those great writers, thinkers, poets, and humanitarians of the 2oth Century: James Baldwin, Amiri Baraka, Angela Davis, Ishmael Reed, and those are just a few of them. Toni Morrison, Nikki Giovanni, bell hooks, Wanda Coleman, Cornel West, Tavis Smiley, Walter Mosely and Oprah Winfrey have also passed through the doors at one of their two locations (the other is in Oakland). In San Francisco, the purple building stands near the corner of Post, at the former location of Jimbo’s Bop City, the Fillmore’s premier jazz spot, back in the day. I mention all this on the first day of what I expect will be a long hot summer here in our chilly little town, because some of us are concerned about such things. Yes, it’s for some of the usual reasons small businesses and booksellers have been struggling in the Amazonian jungle for a decade, exacerbated by the economy’s mess, but the wages of income disparity have also come to bear, the way it makes some people in town go boom while the rest of us go bust are also mixed up in it. You can read more about the store’s situation; as these circumstances do not resolve overnight, the fight to save Marcus Books has really only just begun. As a native daughter of western San Francisco, I’ve recently returned home following some years in Atlanta, Los Angeles and on another side of town, and Marcus Books has since became my new favorite old place here. There are only a handful of places like that here, where I find it harder and harder to recognize the people and places I used to know as uniquely San Francisco. But some of what I remember best about our town’s openness, and willingness, I re-found at Marcus. There, if you are so inclined, you might talk to Karen Johnson about James Jamerson. Or Charles Mingus, Soul Train and Don Cornelius; Fillmore Street’s jazz heritage, quantum physics, Marvin Gaye and the beginning of all life in Africa. Self-reliance, self-knowledge, the rise and fall of Egypt, astrology, numerology; Harry Belafonte, Smokey and Stevie may come up, depending how you go. I don’t know about you but there aren’t too many places in town where people are conversant in the things I want to talk about and that’s just my own personal reason for wanting Marcus to hang around. The other is that I care about Karen, her family, and of course the general community in the Sucka Free City, served by the book store. It has been said that the Fillmore is the heart and soul of San Francisco; certainly I have been witness to those flavors at work at Marcus Books in the hands of the Richardson-Johnson family. And because there is hardly any other place on earth I’d rather be than in a friendly neighborhood book or record store, chances are if you’ve read this far, I suspect you feel the same way too. So please, if you will, sign the petition to help Marcus Books, the oldest African American Bookstore in the United States stay around not only to educate the young and curious, the avid reader and casual seeker, but to stand as one of the longest standing community safe places for black authors and black people, and all folks, even those who are white, like me. A gathering of concerned customers and citizens will convene at the store on Saturday June 22 at noon. Marcus Books is located at 1712 Fillmore Street in San Francisco.